A busy year of residential weekends, intensive training, mentoring, online group work and one-to one support from The Touring Network team resulted in the 2016/17 cohort of Youth Promoters programming a tour for Kathryn Joseph which was a great success, and left them feeling confident about their challenge. 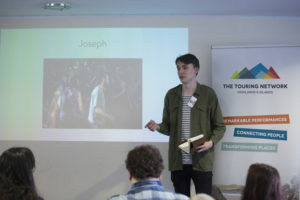 In deciding who to book for their tour, The Youth Promoters used their Go See bursaries to check out performances that may be able to tour the Highlands and Islands – they attended a variety of festivals including Alice in Wasteland, Edinburgh International Festival and Loopallu which offered insights into diverse genres and ideas for musical artists. Some of these events included large productions such as GRIT Reimagined (orchestral version of Martyn Bennet’s album GRIT) at Edinburgh International Festival and the Glasgow Girls (Dundee Rep Theatre), with a view to seeing if they could tour a scaled down version. They also looked into The Cheviot, the Stag and the Black, Black Oil which unfortunately was now too large to tour to small venues. An unexpected outcome of Go See was that Company of Wolves was booked by the UHI student Promoters after seeing The End of Things in development at the CCA in Glasgow. 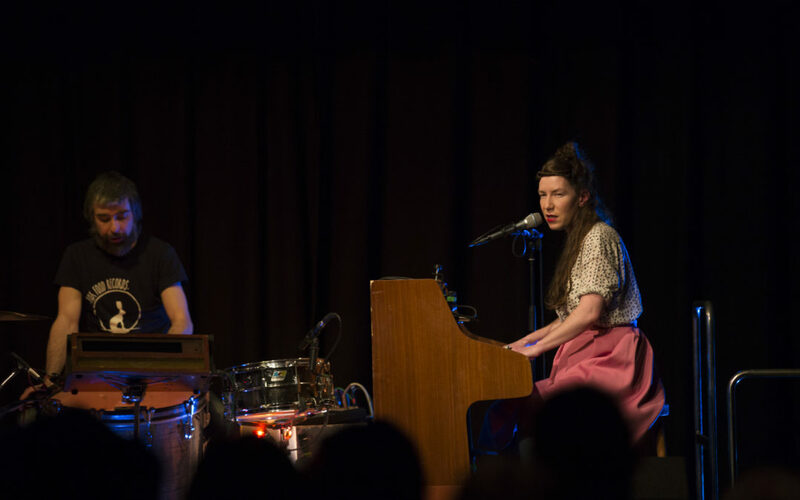 The final decision came about after Kathryn Joseph had been spotted at the Paisley Spree by Youth Promoter Kerry, where she was playing songs from her debut album – bones you have thrown me and blood I’ve spilled, winner of Scottish Album of the Year Award in 2015. After much negotiating, the deal was done and GET IN contracted Kathryn to play 8 shows, launching at The Touring Network’s Spring Gathering in Boat of Garten. The GET IN team also made the decision to champion four local supporting artists at the performances. The marketing was a mix of both national and local strategies. The Youth Promoters decided to spend some of their budget on professional help, commissioning Oh Really Creative, which resulted in editorial in national press and an interview on The Janice Forsyth Show at the BBC Pacific Quay. 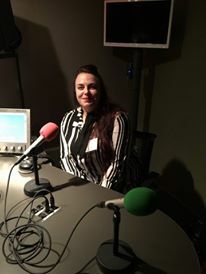 Youth Promoter, Kerry (from Islay) managed to join her in the studio for this interview which gave her an experience of a professional environment. In a more local setting Kerry was creative in her marketing, not only producing an article for the local press, but also with a competition for two free tickets and a goody bag. Kira, from Knoydart, undertook a different challenge. 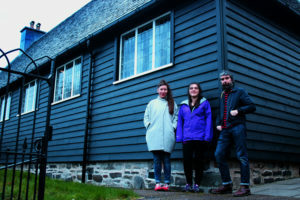 Currently a sixth-year pupil at Mallaig High School, she has been involved in organising musical events on Knoydart for several years, but chose to promote the show in an unfamiliar place. One of the benefits of GET IN is simply that a group of young people came together in real time, over a large geographic spread with a common interest. The programme has resulted in many outcomes beyond the tour itself and the Youth Promoters have gained a huge amount of skills as well as overcome some unforeseen challenges for themselves and their communities. ‘Everyone has slightly backgrounds coming in to this, and the knowledge is all going to be applied in slightly different ways. I’m not a promotor in my day to day but more a musician.All of the stuff from the GET IN has been very useful in a number of different aspects of my life … the program was really useful in giving me an insight of a promotors perspective, and things I could do that would make me be taken seriously. Also what I can expect from promotors and ask them for … planning the KJ tour has shown a lot of things I wasn’t previously aware of and thoughts to make things easier. For all of my projects, the Highlands is the homeland – the two albums I brought out last year were launched up here, as were many of our gigs. But I still didn’t have a total understanding of the lay of the land – places we could gig, people who can put stuff on, other opportunities for showcase or funding. We are very thankful to all our supporters, all the guest speakers who shared their enthusiasm and experience, Cal Mac for their sponsorship with the Islay ferry fares, Stephen MacIntosh who helped enormously with the PA and especially the Promoter Mentors who volunteered their time to support the Youth Promoters. 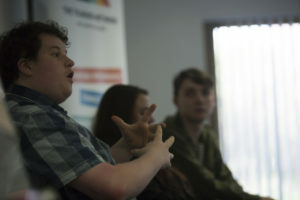 Last, but not least, we are very thankful for the funders who have invested in the young people of the Highlands and Islands to create a new network of possibilities for their communities, Creative Scotland, Young Start (Lottery), Ignite Moray Youth Arts. 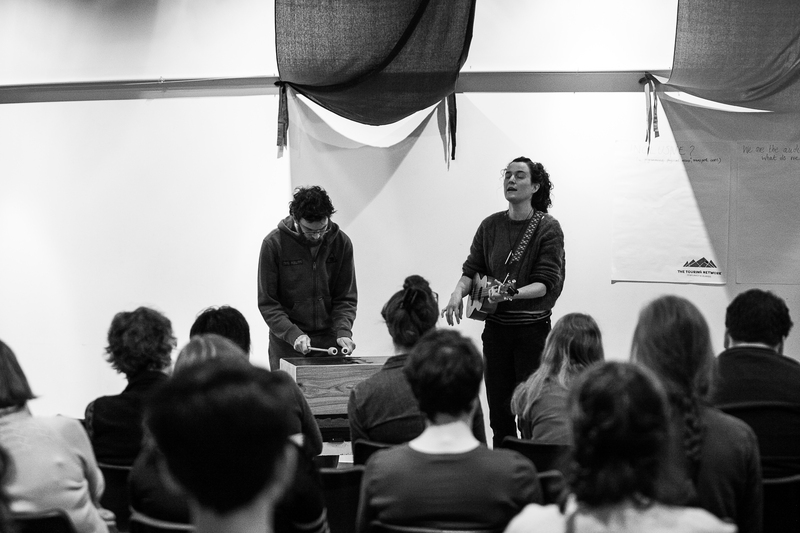 Thanks to additional funding from the Gannochy Trust and the Robertson Trust three of our GET IN Graduates will continue programming live performances across the Highlands & Islands this year, and will act as peer buddies for the 2017/18 intake as they begin their journey as GET IN Youth Promoters. Watch this space for news of upcoming events.